1 Who is Alicia Vikander? Alicia Vikander is an Oscar-winning Swedish actress, who is probably best known for portraying the character named Gerda Wegener in the critically acclaimed biographical drama movie “The Danish Girl“. 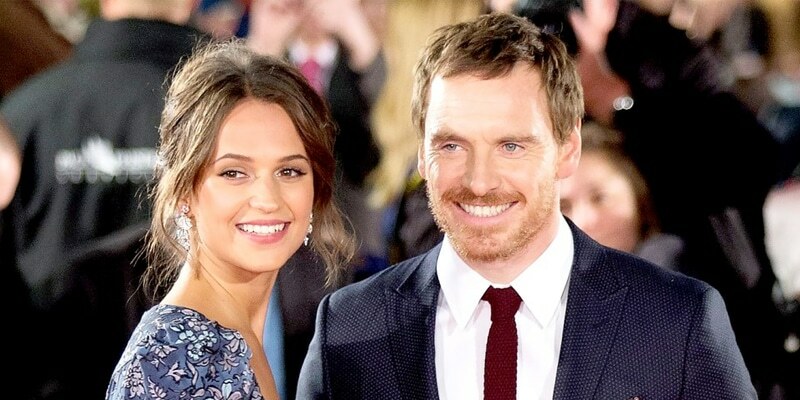 Apart from being recognized for being the spouse of a colleague, Irish Oscar-nominated actor Michael Fassbender, Alicia is also widely known for memorable appearances in movies such as “Ex Machina” and “Testament of Youth” – both in 2014 – “The Man from U.N.C.L.E.” (2015), as well as “Tomb Raider” (2018) in which she portrayed the main character and one of the most famous fictional characters of all time – Lara Croft. Alicia Amanda Vikander was born under the zodiac sign of Libra on the 3rd October 1988, in Gothenburg, Sweden, and apart from Swedish, she is also of “one quarter” Finnish descent, so is of white ethnicity. Alicia is the only child of psychiatrist Svante, and Maria Fahl-Vikander who is also an actress, so it is small wonder that she has made a successful acting career herself. Her parents split up when she was only two months old, so she was raised by her mother, however, she grew up in a big family alongside her five half-siblings from her father’s new family, which she visited every two weeks. At the age of nine, Alicia began her ballet lessons at the Svenska Balettskolan i Göteborg, then at the age of 15 she relocated to Stockholm, and enrolled at the Royal Swedish Ballet School where she was schooled to become a principal dancer, before training within the prestigious New York City’s School of American Ballet. After her career became sidelined due to injuries in her late teenage years, Alicia discovered her passion for acting, and decided to pursue a career in the movie-making industry full time. Alicia began her acting career at a very early age, appearing in several minor stage plays at The Göteborg Opera. Her on-camera debut occurred in 2002, when she was cast in Swedish TV movie “Min balsamerade mor” which was followed by an appearance in the “The Befallen” TV mini-series. After honing her acting skills through her teenage years by appearing in several episodes of the “En decemberdröm” TV series, and in a streak of short movies such as the “Standing Outside Doors” (2006), to greater prominence Alicia Vikander came in 2007 when she was cast to portray the character of Josefin Björn-Tegebrandt in popular Swedish TV drama series – “Second Avenue” (in Swedish: “Andra Avenyn”). In 2010, Alicia entered the limelight when starring as Katarina, the main role in the critically acclaimed movie drama “Pure” (in Swedish: “Till det som är vackert”) for which she was honored with several prestigious accolades, including the Stockholm Film Festival’s Rising Star Award, Guldbagge Award for Best Actress, as well as with the Berlin International Film Festival’s Shooting Star Award. This venture was followed by two other major roles, in the critically praised Swedish movies “The Crown Jewels” (original title: “Kronjuvelerna”) and “A Royal Affair” (original title: “En kongelig affære”). Onto the international acting scene Alicia stepped in 2012, when she was cast for the role of Kitty in Joe Wright’s adaptation of Leo Tolstoy’s eponymous novel – “Anna Karenina” – starring opposite Jude Law and Keira Knightley. It is certain that this appearance significantly helped Alicia Vikander to establish herself in the movie-making industry as a young but promising actress. The real breakthrough in Alicia’s career occurred in 2014, when she was cast for the role of Vera Brittain in biographical movie drama about love as well as the futility of war – “Testament of Youth”, for which performance Vikander earned numerous positive reviews. Later that year, after appearing in the action drama movie “Son of a Gun”, Alicia was cast for the main role of a humanoid robot with artificial intelligence named Ava, in Alex Garland’s Oscar-winning Sci-Fi thriller movie “Ex Machina”. This appearance has earned her not only a BAFTA Award nomination but a Golden Globe Award nomination as well, among several others. The year of 2015 was also quite busy for the young Swedish actress, as she appeared in three movies – the comedy drama “Burnt”, Hollywood’s action comedy movie “The Man from U.N.C.L.E.”, as well as in the historical drama movie “The Danish Girl”, in which she portrayed Gerda opposing Eddie Redmayne. The latter engagement also brought Alicia several prestigious accolades, such as nominations for BAFTA and Golden Globe Awards as well as for a prestigious Oscar Award. With her career on the path to stardom, Alicia began appearing in more demanding and memorable roles – in 2016 she played opposite Matt Damon in action thriller movie “Jason Bourne”, and starred alongside her now-husband Michael Fassbender in the romantic drama movie “The Light Between Oceans”. Prior to appearing in the leading female role in historical drama movie “Tulip Fever” in 2017, Vikander also voice-acted as Huppu in the animated movie “Birds Like Us”. Speaking of her most recent professional engagements, in 2018 Alicia starred in the title role of in Hollywood’s blockbuster action adventure movie “Lara Croft”. Alicia and Michael first met in September 2014, when they both joined the set of “The Light Between Oceans”. Following the movie’s story-line, the two developed genuine feelings for each other off-camera, and soon afterwards began their relationship. Their first public appearance occurred at the 2016 Golden Globe Award ceremony, while in 2017 the couple decided to bring their relationship to a higher level and tie the knot, on the 14th October in a privately held ceremony in Ibiza, Spain. Despite the rumors of their break-up and the age gap, the couple’s relationship is apparently as strong as ever. When they’re not filming, Alicia and her 11-years-older husband split their time between London and Lisbon, Portugal. Prior to this marriage, in 2012 Alicia allegedly dated colleague, Swedish actor Alexander Skarsgard. Have you ever wondered how much wealth this young and talented Swedish actress has accumulated so far? How rich Alicia Vikander is? According to authoritative sources, it is estimated that the total of Alicia Vikander’s net worth, as of mid-2018, revolves around the sum of over $9 million, primarily acquired through her on-camera acting career since the early 2000s, and during which she added over 35 acting credits to her professional portfolio. The 29-year old acting star sports a slim and toned figure, featuring a height of 5ft 6ins (1.68m) and weight of around 116lbs (53 kg), which in addition to her hourglass silhouette with vital statistics of 34-24-34, dark hair and dark piercing eyes, make her appearance quite alluring. Her bra size is 34A, while her dress size appears to be 6 (US) and her shoe size is US 8.5.